- why does the Lord reincarnate to propagate the awareness and practical implementation of the Vedas? - how do the Vedic Hymns transcend the commonly perceived notion of their association to Hinduism and also be applicable to all other religions? 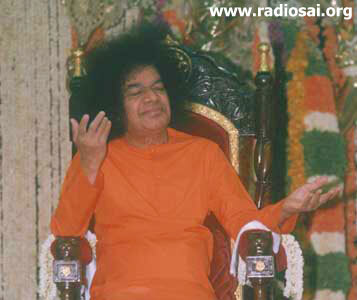 This article is a humble attempt to contemplate on these questions and the insightful revelations that were conceived with Bhagawan’s Divine inspiration and grace. 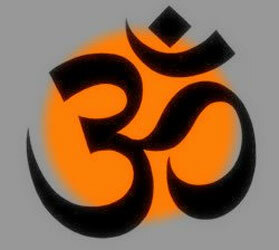 “He unfolded a deeper and significant meaning for Samskritam: Kritam means ‘to do’ and Samyak meaning ‘in unity’. Samskritam is hence not a language; it is an awareness of the self revealed by practice with the unity of thought, word, and deed. Sruthi (intent and active listening) and Smruthi (active practice) thus became the basis of Veda Dharma (a way of life) and its propagation for time eternal. VEDA contains four letters that signify the most important aspects of practical spiritual life: Values, Educare, Devotion, and Awareness. These four represent the quintessential Vedic message. Unvarying practice of the Human Values with a constant quest to Know the Self (Educare), and endless adoration of the all pervading Supreme Lord (Devotion or Bhakti) leads to constant integrated Awareness (Prajnanam). Interestingly, switching the letter V and D in VEDA makes it DEVA (meaning God in Sanskrit). Hence, VEDA and DEVA are the reflections of each other; DEVA the primary focus in a religious context and VEDA, a primary focus in a spiritual context, both leading to the same target of Self-Realization. The above hymn, from a literal standpoint, would mean that the one who understands the flowers (Pushpa) of waters (Apaha) and its relationship to the moon (Chandra) will reach the highest abode. 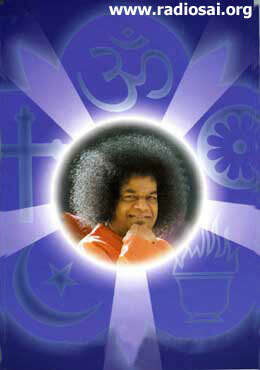 According to Bhagawan Baba, Apaha (the waters of Life) is Love. Contemplating on the Mantrapushpam with Love substituted for Apaha unfolds a deeper and significant meaning: the one who understands the inner significance (Pushpa) of Love (Apaha) and its relationship to the mind (Chandra) will reach the highest abode. This mantra points the way beyond the confines of religion to universal human experience which the remainder of this article will expand upon. The Mantrapushpam elucidates several aspects of creation which are the basis for several religious faiths. In fact, this article will show you how Mantrapushpam relates to all the religions represented in the Sarvadharma Symbol, which depicts the essence of Bhagavan’s Universal Love. We first look at the religion founded by Zoroastra. This verse means the one who understands the significance of the sacrificial fire reaches the highest abode. ‘Agni’ means the fire. The fundamental basis of Zoroastrianism is the sacrificial fire. ashâchâ ishuudem ratûtô xshmâkâ xshathrâ ahurâ fershêm vasnâ haishyêm dâo aham. Wise One, tell me now the best words and deeds through good mind. Make life truly renovated with Your sovereignty as You wish. " “Asouvaitapannaha” means the scorching sun. The Cross is symbolic of the pain and suffering of the scorching sun. 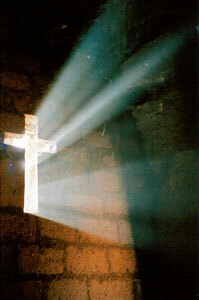 Annihilation of the ego and the body consciousness on the cross is the essence of Christianity. The Love of Jesus for his fellow beings aids us in conquering body consciousness. This verse means the one who understands the interconnection between Love and the ‘Annihilation of the Ego’ reaches the supreme abode. Which means, "Lord have mercy on us. Christ have mercy on us." "This is all that needs to be known. The one who is illumined by Love attains the highest abode." “Chandra” means the moon. The changes of the moon are interconnected to vagaries of the mind. Fixing the mind that is filled with Love on the supreme Lord captures the spirit of Islam. Thus this verse means the one who understands the connection between the mind of fixed faith and Love reaches the highest abode. 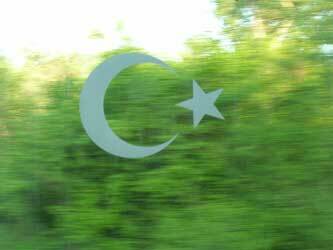 Which means: "In the Name of Allah, the Caring and Kind. Tell everyone: 'He is One God; Allah, Who is forever. He doesn't have children and He was never born, and there is nothing the same as Him." "This is all that needs to be known. The one who is illumined by Love attains the highest abode. " “Nakshatram” means star. 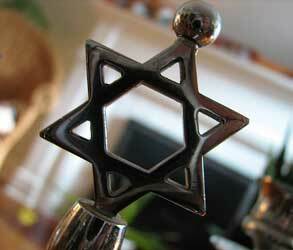 The Star is symbolic of the all pervading consciousness and the soul of Judaism. Thus this verse means the one who recognizes the grandeur of the omniscient, omnipresent and omnipotent Loving Lord reaches the highest abode. Samvatara” (Year) represents time. 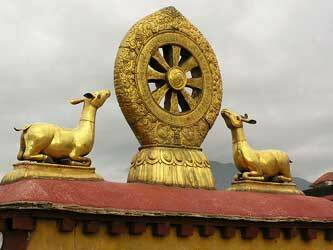 The Buddhist wheel is symbolic of the Dharma which is related to the time of cause and consequence. Love in action is Dharma which is beyond time. So this verse means the one who understands the interrelationship between Love and Time (Action) attains the highest abode. Bhagavan has given us the spiritual meaning of the Buddhist wheel as follows: ‘Remember the wheel of cause and consequence and the wheel of dharma that rights them all. "I go to the Buddha as my refuge. I go to the Dhamma - His Doctrine, as my refuge. I go to the Sangha - His Holy Order, as my Refuge." Let there be Peace, Peace, Peace.